Perfect for those wanting to grow their own fruit, vegetables or herbs, but without the space in borders or allotments, this is a larger version of the 1m bed. The raised design saves any back-breaking bending over and kneeling down. Suitable for all types of fruits and vegetables with deep-rooted plants suiting the centre of the bed and shallow-rooted ones preferring the sides. Made from pressure treated FSC Certified timber. Supplied flat-packed - self-assembly required. The Vegetable Grow Bed is perfect for those wanting to grow their own fruit, vegetables or herbs, but without the space in borders or allotments. Stylish, yet practical, the manger styled bed saves any back-breaking bending and kneeling down and is suitable for all types of vegetables. You can mix and divide up planting with deep-rooted plants suiting the centre of the bed and shallow-rooted ones preferring the sides. 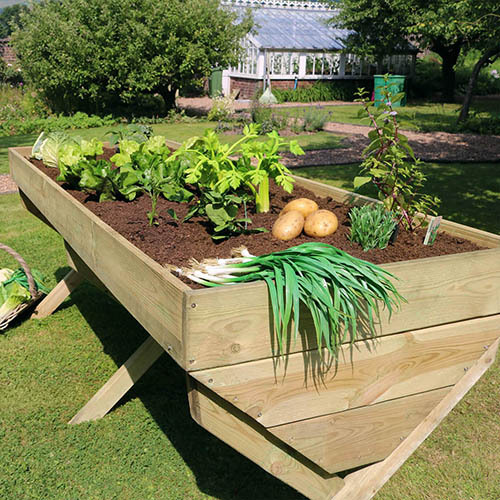 Made from pressure treated FSC Certified timber, the Vegetable Grow Bed is strong and durable so can be used year after year to keep your tasty fresh fruit and veg growing! Also available in 1m.